Discover the most intriguing, fascinating and extraordinary facts about the world in this lavishly illustrated, large format atlas. 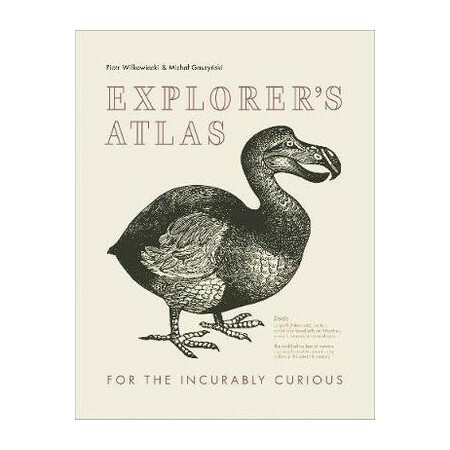 Feed your imagination and go on an adventure with this unusual atlas which is illustrated with a wealth of quirky facts and curiosities from around the world. Uncover hidden secrets on every page - from world cultures to history, the economy to nature, geography to sporting events and following the trails of great explorers. Be inspired and surprised by carefully selected and composed text, with icons, graphics and routes that will make you see the world through different eyes. Plan your next adventure, or revisit where you have been already - Explorer's Atlas has been created for travellers, map lovers and adventurers of any age. Founding members of the hugely successful `Explorer's Atlas' Kickstarter campaign, Wilkowiecki and Gaszynski currently live in Warsaw, Poland. Piotr Wilkowiecki holds a degree in finance and co-founded Seal Creative, a start-up focused on combining great design and a passion for map-making. Michal Gaszynski is a graduate from two leading business schools and works as a marketing specialist and graphic designer.